Any electrical repair in your home involves turning off the power to the circuit you'll be working on, and you do this at the main electrical service panel. You may know the service panel as the breaker box, while in the trade it's officially called a load center. The main service panel is like the switchboard for all the electricity in the home. It receives the incoming power from the utility company and distributes it to each of the circuits that supply the various lights, outlets, appliances, and other devices throughout the house. Everything but the incoming utility power can be shut off and turned on at the main service panel. A service panel is a steel box with a hinged door or lift-up panel on the front. With the door open, you can access all the circuit breakers in the panel. Typically, one panel feeds the entire house, but there can also be another, smaller panel, called a subpanel, which may be used to serve a specific area, such as an addition, a large kitchen, or a detached garage. A subpanel works just like a main service panel but is supplied by the home's main panel rather than by the utility lines. Each circuit breaker is controlled with a lever that can be set manually to an ON or OFF position. If a circuit breaker trips, usually due to an overload or other problem with the circuit, the lever will automatically move to a third position between ON and OFF. Breakers should be labeled to identify the main area or appliance served by the breaker's circuit. Labels may be stickers or hand-written words next to breakers or on a sheet adhered to the inside of the panel door. Note: Older homes that have not had their electrical services upgraded may have service panels with fuses rather than circuit breakers, which have been standard since the 1960s. When you open it, the panel door gives you access to the circuit breaker switches, but that's all. And that's as far as most homeowners need to go. 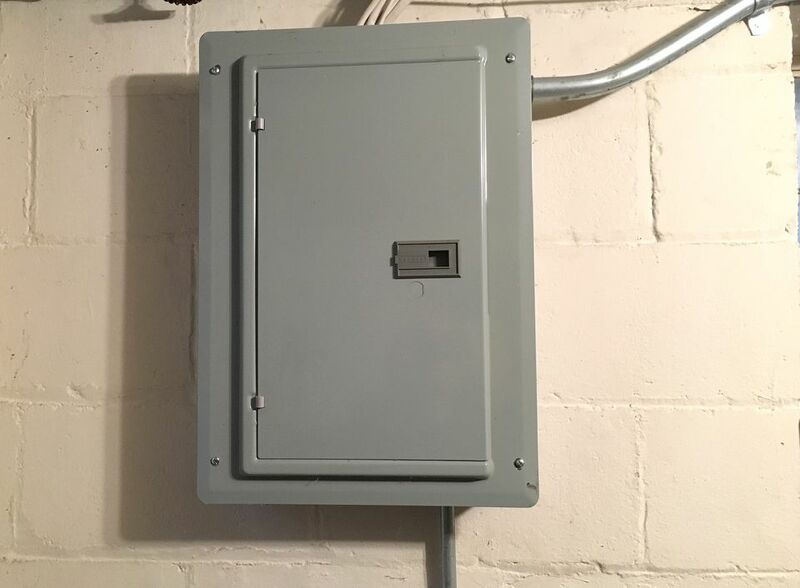 However, to get inside the panel to install or replace a circuit breaker, you have to remove the protective cover around the breaker switches, known as the dead front cover. The dead front cover is typically held in place with a screw in each corner. Removing the cover provides access to all components of the panel. Some panels have a separate door and cover; others have a door and cover as parts of the same unit. Warning: Always shut off the main circuit breaker (see next slide) before removing the dead front cover. This shuts off the power to all of the circuit breakers and household circuits but does not shut off the power from the utility. The utility service lines and the terminals they connect to inside the panel remain live (carrying deadly electrical current) unless the utility company shuts off the service to the home. The main circuit breaker is a large breaker usually located at the top of the panel but sometimes near the bottom or along one side. It controls all the power of the branch circuit breakers (the breakers controlling individual circuits) in the panel. Power comes from the utility service lines, flows through the electrical meter on the outside of your house, and continues into the service panel. The main circuit breaker is often called a double-pole service disconnect and is what controls the live power energizing the circuits in the electrical panel. It's easily recognizable by the two thick black wires feeding it from the electrical meter and consists of two circuit breaker handles joined together. The main is used to turn power to all the branch circuits ON or OFF at the same time. The main circuit breaker also identifies the total amperage capacity of the service panel and will have a number on it identifying its amp capacity, such as 100, 150, or 200. The standard for new panels today is 200 amps, but panels can have higher capacity. Warning: The main circuit breaker shuts off the power to all of the branch circuits but does not shut off the power from the utility. The utility service lines and the terminals they connect to inside the panel remain live (carrying deadly electrical current) unless the utility company shuts off the service to the home. The two thick, black service wires feeding the main circuit breaker each carry 120 volts from the electric meter and feed the two "hot" bus bars in the panel. Circuit breakers snap into place onto one or both of the bus bars to provide power to the circuits. Single-pole circuit breakers provide 120 volts and connect to just one hot bus bar. Double-pole circuit breakers provide 240 volts to a circuit and snap into both hot bus bars. The electrical current leaves the service panel through the hot wires that are connected to the circuit breakers. Single-pole breakers have one hot wire (usually black), while double-pole breakers have two hot wires, which may be black, red, white, or another color. Once the power leaves the electrical service panel through the hot wire(s) of a circuit and does its work through the electrical devices (light bulbs, outlets, etc. ), the electrical current returns back to the service panel through the neutral (usually white) circuit wire, which is connected to the neutral bus bar. The bar connects to the main service neutral and returns the current back to the electric utility grid. In many service panels, the neutral bus bar also serves as the grounding bus bar and is where the individual bare copper circuit ground wires are terminated. In this case, it is often referred to as a neutral/ground bus bar. The main bonding jumper provides a ground connection between the neutral/ground bus and the service panel. Another ground connection is made by the grounding electrode conductor or GEC. This is a bare copper wire that connects the neutral/ground bus bar to a ground rod driven into the earth near the service panel or to metal rebar in the home's foundation. This final ground connection with the earth allows stray electrical current (such as a surge created by lightning) to pass safely into the surrounding soil. Some service panels have a separate bus bar for ground-wire connections, instead of a neutral/ground bus. In this case, the ground bus is electrically connected to the neutral bus in main service panels only; in subpanels, the ground bus and neutral bus are not connected to each other. Single-pole breakers provide 120 volts and typically come with ratings of 15 amps or 20 amps. These breakers make up most of the breakers in your home. Double-pole breakers provide 240 volts and come in ratings from 15 amps to 50 amps. These breakers usually serve dedicated circuits for large appliances, such as electric dryers, stoves, and air conditioners. Ground-fault circuit-interrupter (GFCI) breakers protect an entire circuit from ground faults. Arc-fault circuit-interrupter (AFCI) breakers protect an entire circuit from arc faults. Some dual-function breakers may provide both GFCI and AFCI protection simultaneously. What Are Some Basic Tips for Wiring Electric Water Heaters?